Okay, maybe not terrible. Give me a decent DSLR or my mirrorless Olympus OM-D EM-1, and I’m actually pretty good. But when it comes to photography with a mobile phone, I’m pretty much inept. It’s partly because I keep switching camera phone apps, and partly because I’m used to the more forgiving nature of larger sensors and better lenses. I generally like shooting with ambient light, and rarely use flash or external lighting, except for product photography in my garage studio. I get great results with the Olympus, even though it’s micro 4/3rds sensor is smaller than the full frame DSLR sensors I used to use. One of the issues for me with iPhone photography is lighting. Shooting with ambient light means disabling the flash. The sensors in mobile phones are small; the iPhone 6 sensor is just 1/3″, or roughly 29 square millimeters. Compare that the the micro 4/3rds sensor in the Olympus, which is almost 374 square millimeters. So the 4/3rds sensor captures much more light in a given scene at the same shutter speed and aperture than the phone sensor. Mitigating this a bit is photosite size — the size of the individual pixels. Apple kept the iPhone 6 sensor at 8 megapixels, so each photosite captures a bit more light than higher resolution sensors of the same size. The bottom line: phone sensors don’t do well in dim light. 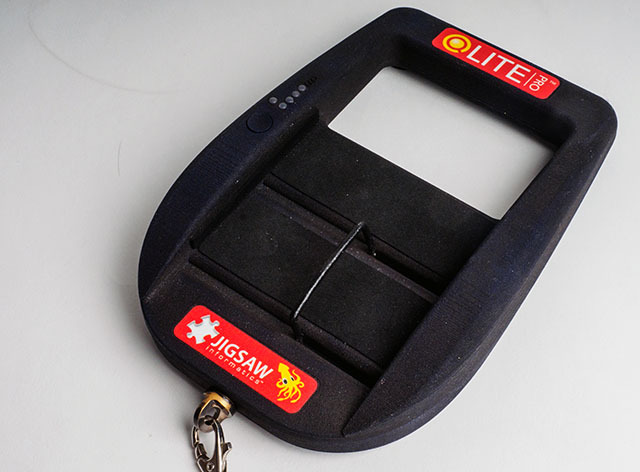 Enter the QLite Pro EZ Grip, designed by Jigsaw Informatics. 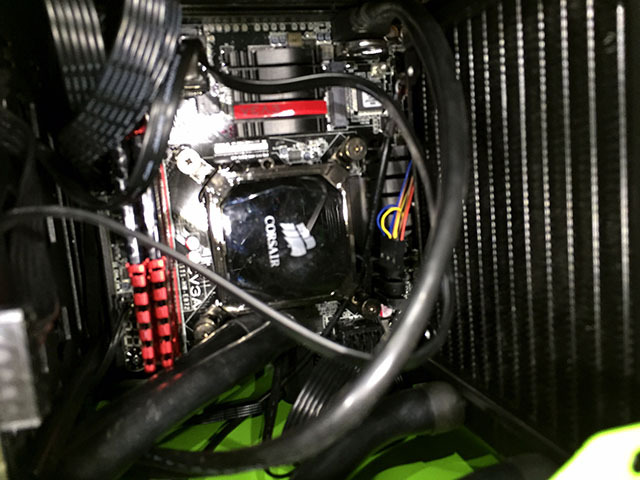 The device is the brainchild of Ross Smith, who has kicked around Silicon Valley for decades, and once help start up 3dfx, one of the pioneers of consumer 3D grahics chips. The QLite is essentially a ring light for your phone. 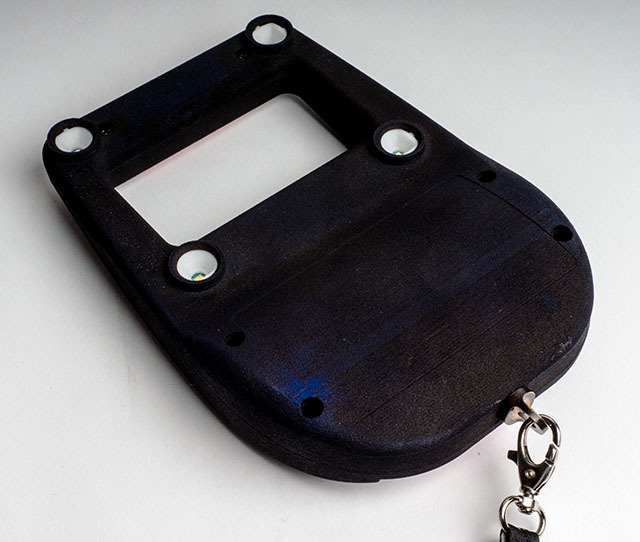 The QLite shown here is a working prototype. Brightness is controlled by the button on the left side of the unit. The metal bracket shown on the left braces the phone, and is spring loaded. When you flip the device over, you can see four white (roughly 5000K) LEDs surrounding the opening and exposing the phone sensor. Note that this is not a flash unit; instead, the unit produces a steady light at two different, user-selectable brightness levels. One potential issue is asymmetric lighting in close-ups, but in practice, that didn’t seem to be a major issue. The QLite Pro includes a 2,600 mAH battery. The battery powers the LEDs, but can also be used to charge an external device (like your phone.) Jigsaw built a pair USB ports into the base of the unit, one standard and one mini. The QLite charges via the mini-USB port, while external devices can be charged via the full-size port. The user interface is dead simple. The single button selects the two different lighting levels. Push it once powers up the device into its base lighting level. Push again, and you get a brighter light. One more push powers the QLite down. Hold the button down for several seconds shows battery status. Battery life when used just as a ring light is up to nine hours. Both the base lighting level and high power level are brighter than the single LED built into most phones. On top of that, my iPhone can’t run the LED in flashlight mode when I’m using the camera; the LED is usable only as a flash. So the QLite serves two purposes: lighting a dark area, as well as supplying steady light for the camera. Another possible use is quick-and-dirty photography for selling gear on eBay, Craigslist, and related selling sites. Most of the time, you don’t really need high resolution photography shot with sophisticated lighting. The QLite serves admirably for this type of photography. The QLite Pro isn’t perfect. 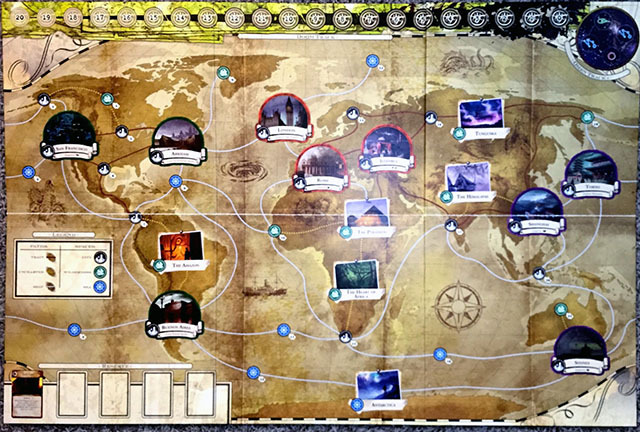 Since it doesn’t connect directly to the camera, and only offers two lighting levels, it can create glare in certain situations, like this top-down photo of a board from a tabletop game. It’s easy to mitigate this by adjusting the angle of your shot a bit, but you should bear this in mind when shooting. The asymmetric mount also means composing a bit more carefully, particularly with close-ups. At $40, the QLite Pro enables handymen, mechanics, and anyone working in dark, cramped places. Using the phone enables a tech to shoot a quick photo in a darkened area and upload it for more analysis in real-time. For users on-the-go, it’s a little bulky to carry around, but easily fits in a backpack or toolbag. As a tool for hobbyist photographers, it’s less useful. A more symmetric phone mount would help. I’d also like to see two more LEDs, mounted halfway along the longer axis, plus more level settings. Another useful addition for photographers would be a 1/4″ thread mount for a small tripod. That would allow me to use the QLite as a simple, off-camera light on a small tripod. The first Kickstarter page for QLite read like something from a Grainger catalog — great for potential buyers in certain businesses, but Kickstarter tends to be more consumer oriented. 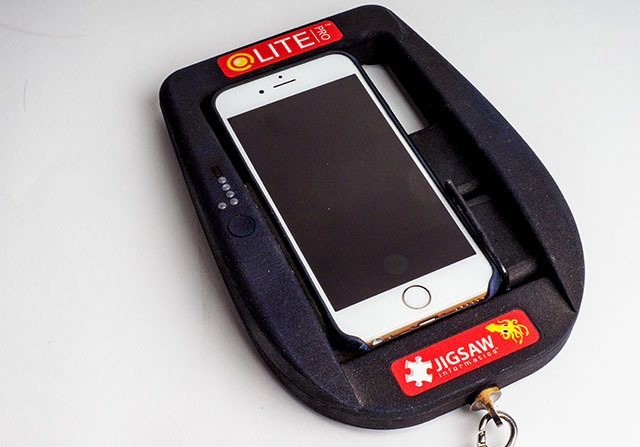 Jigsaw didn’t hit their funding goal, so I hope they retool the Kickstarter pitch and relaunch, because the QLite Pro has great potential. I’d love to have one in my bag of photographic tricks. Maybe I could become a better iPhone photographer. I know you have 1/4-20 mounting socket but maybe adding a magnetic plate someplace on the body. That may be useful in some applications. Looks like a very useful product. I could see contractors using this as shown on their Kickstarter page. Thanks for the review! You’re right about the Kickstarter… I think I did not do a good job of connecting with the Kickstarter demographic. We will likely resubmit but focus more on the unit’s ability to help with document scans, which is quite profound. BTW– the QLP does have a 1/4-20 receiver in the base. Your first photo shows something screwed into it!